Filipe Vilas-Boas’ laser display changes using text message commands sent from a smartphone. If you’ve ever looked up at the night sky and wondered, “Can I ever make my own constellation?” Now you can. Filipe Vilas-Boas, a French Interactive Art Designer, designed a way for you to create your very own constellation, with the help of some lasers and a mobile phone. Spectators are encouraged to send texts to a PC that changes the laser parameters. Vilas-Boas’ installation is established as a series of colorful laser beams, controlled by a computer, which responds to wishes of a standard text message. Spectators (and arguably, ‘artists’) can command the computer to display streams of lasers by sending it a text message containing a number that corresponds to a specific area within the space. 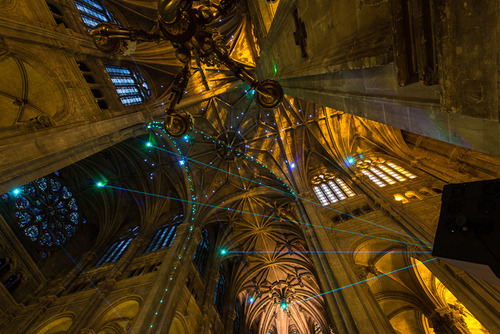 When laser beams intersect in a specific way, it forms a gothic-like cross, in all its multi-colored glory. 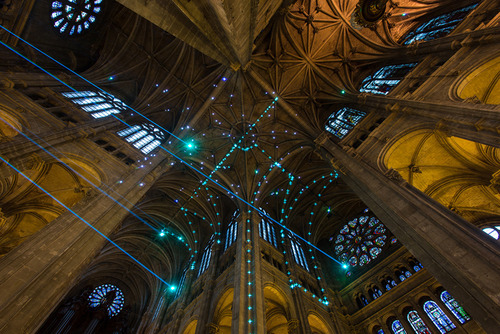 The interactive laser display is being featured at the Saint-Eustache Church in Paris. 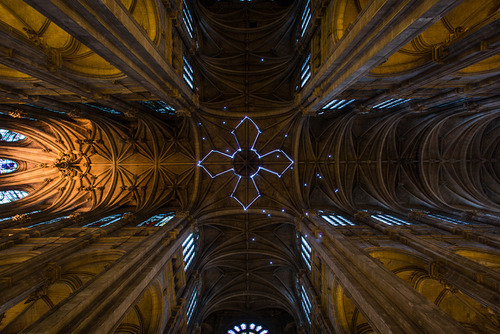 The interactive art installation is currently at home at the gothic Saint-Eustache Church in Paris, France. The project is called “Shooting Thoughts,” as the designer believes the view is, at any time, a representation of the collective thoughts of the people experiencing the beautiful “night sky.” Vilas-Boas believes that stars are representative of the human experience, since both individuals and stars create their own “trajectories,” at their own speeds. If you’re in Paris, you’ll definitely want to check out the light show. If not, scroll down to see the gothic church in all its glory. And you thought colorful lasers were just for raves. To see more of Filipe Vilas-Boas work head over to his tumblr page.